As a book coach, I’m often asked the blanket question: “So how do I write a book and get it published?” Want to know the short answer? Make the decision. That’s really the first step. 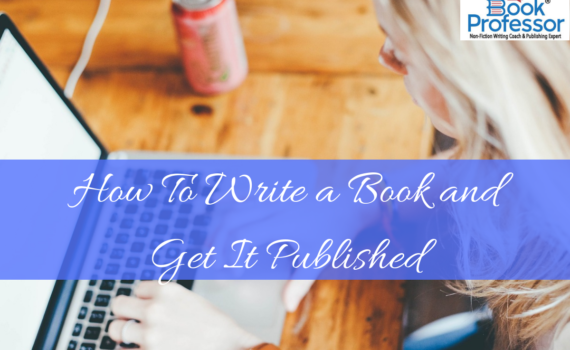 Once you’ve decided that you’re ready to write a book and get it published, following the guideline below will put you on the right track. Initial Book Writing – The first step is to plan your book project in a BookMAP and write all the components until you have a finished manuscript. This is where you invest your time, energy, and emotion, and when you are finished you will have accomplished something few others have done! You will have a complete manuscript. Book Focus Groups – I’m a big believer in focus groups, and the best way to understand if your manuscript achieves its goal is to gather a group of six to ten people who are part of your target market, give them a copy of your manuscript, and ask for their raw feedback. This will be invaluable to you. When you receive that feedback, you make the changes you think are appropriate, then pass the manuscript to your editor for final editing. Final Editing Process – This time, you need what we call line-level editing. You editor will scrub your work and make corrections in punctuation, verb tense, spelling, and sentence structure. They will correct your grammar and make suggestions about how to rewrite your sentences for clarity. Proofreading – If you want a flawless manuscript, you can’t skip the step of hiring a proofreader. Understand this: You are not a capable proofreader. You already know what your story is supposed to say, and your brain will fill in any gaps with what you intended. Once these steps are complete, you are ready to turn your manuscript into a book. Before you design your book, you need to know what you want to produce, and you have a lot of choices to make. Do you want a hardcover book? Or a softcover? Both come in a myriad of sizes, and you need to decide which size best fits your format. Will you issue an eBook, and if so, you need to prepare separate digital files for Kindle, Nook, and iPad. One of the most important elements is your book cover design. Your title and your book cover art will work together to invite the reader to purchase the book. They also work together to communicate the essence of your book, while creating a key question in the potential reader’s mind: What is this book about? Remember that books are often shelved with only the spine visible, and you will want yours to stand out. What will the spine of your book look like? Try adding a dash of color to draw attention. When turning your attention to the interior design, consider these questions: What fonts are you going to use? What will your copyright page look like? Your table of contents? You must use industry standards for chapter starts and page numbering. And be sure you’ve calculated the appropriate thumb holds – that’s the margin space where a reader places their thumbs to hold the book. Readers should not have to shift their thumbs while reading the book because this causes a degree of stress that interferes with their reading experience and causes fatigue. Just for fun, take a look at some book interiors, and notice how they differ in style to match the book content. You need a professional designer for both the book cover an interior. Of course, you’ll need to get your book produced, and you have several options. Do you want to use an on-demand printer that will print the books as they are ordered? There’s a higher cost per book for this option, but you won’t have to put your money into the inventory up front. However, if you want to pay the lowest possible amount per book, you will opt to print a large quantity of books and warehouse them until they are sold. The warehouse can be your basement, and many authors like this option because they can maximize their profits with this approach. So now you’ve got the book in hand. How are you going to distribute it? There are numerous ways to distribute your book and, of course, your eBooks will be distributed online. If you print a number of books, you can elect to ship them out yourself as they are purchased, but bear in mind that this option requires you to have shipping supplies and a fair amount of time to send things out. Some people make arrangements with warehouse distributors or sheltered workshops to send out their books, and others elect to work through book distributors who receive orders and ship them out to bookstores, online retailers, and libraries. All your distributions methods require payment, so find out what the distributor requires before signing any contracts. Books don’t sell themselves, so you need to plan your marketing strategy. Will you engage the services of a publicist? Or will you do what many authors do and use the social media tools that are so readily available? Will you hold events, like book readings? Use email marketing to get the word out? Or go the traditional advertising route? Be specific when defining your primary market. Picture the person who buys your book. Is it a woman between the ages of 30 and 50 who is unhappy with the signs of aging? It isn’t every woman between 30 and 50, it’s a subset of that group. Who are they? What are your secondary markets? Secondary markets are those people/organizations/institutions who will also purchase your book, like educators (if you’re writing about children) or mental health practitioners if you are writing about coming out of a depression. You’re going to use this information when you start reaching out to customers, so think it through. So what’s the most important part of this process? The most important part is always what you are working on right now. Focus on today. Don’t get ahead of yourself. Just do the best possible job on what’s in front of you. There will be plenty of time to focus on what’s ahead. Nancy Erickson is better known as “The Book Professor,” a writing and publishing consultant who specializes in helping aspiring nonfiction authors bring their book ideas to market. Nancy works as a book coach assisting authors that write self-help books, biographies, business books, and other nonfiction books through online courses and book coaching. Contact Nancy with questions or to have her speak at your upcoming event by clicking here. Start Writing Your Book NOW!